Circumferential Road 5, more commonly known as C-5 Road or C-5, is a network of roads and bridges that altogether forms a major route that transverses in Metro Manila, in the National Capital Region of the Philippines. It is also known officially as Carlos P. Garcia Avenue, and as National Route 11 (N11), National Route 128 (N128) and National Route 129 (N129) in the National Route Numbering System implemented in 2014. Expressway portions, part of the North Luzon Expressway Mindanao Avenue and Karuhatan Link, are numbered Expressway Route 5 (E5). The road serves as a beltway around Metro Manila, spanning some 32.5 kilometres (20.2 mi) as it transverses through the cities of Parañaque, Taguig, Makati, Pasig, Marikina, Quezon City and Valenzuela. It runs parallel to the four other beltways around Metro Manila, and is also known for being the second most important transportation corridor, after Circumferential Road 4, better known as EDSA. The road is not yet complete to date, because of certain controversies regarding right of way, but portions of the road are already open for public use. The two segments of the road will be connected together with the completion of the CAVITEX - C-5 Link Expressway, through a flyover over the Skyway and SLEX in the Pasay - Taguig boundary, by 2020. C-5 Road corner Kalayaan Avenue, looking towards Pasig. The C-5 road lies parallel to Epifanio de los Santos Avenue, passing through the cities of Valenzuela, Quezon City, Marikina, Pasig, Makati, Taguig and Parañaque. The road is divided into segments. Also known as the NLEX Segment 9, the NLEX-MacArthur Highway connector is a 2.42 kilometres (1.50 mi) tollway starting from Smart Connect Interchange, a cloverleaf interchange between NLEX-Mindanao Avenue link, NLEX-Karuhatan link and the North Luzon Expressway. The western end of the road is located at MacArthur Highway in Karuhatan, Valenzuela and also a part of C-5 Road. Also known as the NLEX Segment 8, the NLEX-Mindanao Avenue connector is a 2.7 kilometres (1.7 mi) tollway starting from the Smart Connect Interchange, a cloverleaf interchange between the NLEX-Mindanao Avenue link, NLEX-Karuhatan link and the North Luzon Expressway (NLEX) and ending in a 3-way signalized junction with the Mindanao Avenue. The entire 2.6 kilometres (1.6 mi) tollway is designated as part of a C-5 Road. Mindanao Avenue is a 6.7 kilometres (4.2 mi), 10-lane divided carriageway that serves as the main transportation corridor of the Talipapa and Tandang Sora districts of Quezon City. The northern terminus of the road is a dead end 1.1 kilometres (0.68 mi) north of the NLEX-Mindanao Avenue Connector Road and the southern terminus of the road is the Epifanio de los Santos Avenue. The 3.5 kilometres (2.2 mi) portion of the road from the NLEX-Mindanao Avenue Connector Road junction to Congressional Avenue is designated as a portion of the C-5 Road. Congressional Avenue is a 6 kilometres (3.7 mi), 6-lane divided carriageway that serves as the main east to west transportation corridor of Muñoz, Culiat and Tandang Sora districts in Quezon City. The western terminus of the road is Epifanio de los Santos Avenue and the eastern terminus of the road is a junction with Luzon Avenue. The 3.9 kilometres (2.4 mi) portion of the road from Mindanao Avenue to Luzon Avenue is designated as a portion of C-5 Road. The whole segment of Congressional Avenue is designated as part of N129. Luzon Avenue is a 2.5 kilometres (1.6 mi), 4-lane divided/undivided city road that serves as the main thoroughfare of the Holy Spirit district of Quezon City. The northern terminus of the road is a junction with Holy Spirit Drive and the southern terminus is a junction with Commonwealth Avenue. The 850 metres (2,790 ft) portion of the road from Congressional Avenue to Commonwealth Avenue is designated as a portion of C-5 Road. Before crossing ending in Commonwealth Avenue, a 6-lane flyover starts 850 metres (2,790 ft) north of the junction and heads towards Tandang Sora Avenue on the other side of Commonwealth Avenue. Tandang Sora Avenue is a 9.6 kilometres (6.0 mi), 2-lane undivided municipal road that serves as the main thoroughfare of the Talipapa, Culiat and Tandang Sora districts of Quezon City. The western terminus of the road is the Tullahan Road, while the eastern terminus is the junction with Magsaysay Avenue inside the University of the Philippines campus. The original planned route of C-5 included the entire road, however, due to the incapacity of the road to carry a large amount of vehicular traffic, only the 1 kilometre (0.62 mi) portion of the road from the Luzon Avenue flyover to Magsaysay Avenue was designated as a portion of C-5 Road. Furthermore, Tandang Sora Avenue becomes a 6-lane divided carriageway shortly after crossing Capitol Hills Drive, 350 meters south of the flyover. After crossing Magsaysay Avenue, Tandang Sora Avenue becomes Katipunan Avenue. Katipunan Avenue is a 7.3 kilometres (4.5 mi), 10-lane divided carriageway that serves as the main transportation corridor of the Balara and Project 4 districts of Quezon City. The northern terminus of the road is Tandang Sora Avenue and the southern terminus is Epifanio de los Santos Avenue. The 4.8 kilometres (3.0 mi) portion of the road from its northern terminus to the intersection with Col. Bonny Serrano Avenue is designated as a portion of C-5 Road. Shortly before crossing Bonny Serrano Avenue, a 4-lane divided underpass descends from Katipunan Avenue and traverses underneath Col. Bonny Serrano Avenue and ascends into a flyover that immediately connects to E. Rodriguez Jr. Avenue. Col. Bonny Serrano Avenue is a 2.2 kilometres (1.4 mi), 4-lane undivided avenue that serves as the main thoroughfare between Epifanio de los Santos Avenue and Eastwood City. The 500 metres (1,600 ft) portion of the road from Katipunan Avenue to Eulogio Rodriguez Jr. Avenue is designated as a portion of the C-5 Road. A 4-lane divided underpass descends from Katipunan Avenue and traverses underneath Col. Bonny Serrano Avenue and ascends into a flyover that immediately connects to E. Rodriguez Jr. Avenue. Pedestrians cross Circumferential Road 5 beneath the C5 Bagong Ilog Bridge in Pasig City, with AG Saño's "Ang Mamatay Ng Dahil Sayo" mural series in the background. Eulogio Rodriguez Jr. Avenue is a 6.7 kilometres (4.2 mi), 10-lane divided road that serves as the main thoroughfare between Quezon City and Pasig. The entire road, from Katipunan Avenue to Pasig Boulevard is designated as a portion of C-5 Road. The road ends in a junction with Pasig Boulevard and continues onto F. Manalo Bridge that crosses the Pasig River and eventually becomes C.P. Garcia Avenue shortly afterwards. Carlos P. Garcia Avenue is a 7.5 kilometres (4.7 mi), 14-lane divided road that serves as the main thoroughfare between Pasig and Parañaque, passing a small portion in Makati and continuously passing Taguig. The entire road, from the F. Manalo Bridge to South Luzon Expressway (SLEX) is designated as a portion of C-5 Road. The road ends in a junction with South Luzon Expressway. Studies by the PHIVOLCS reveal that a large portion of the C-5 road is built on top of the West Valley Fault. A map of the fault line released in May 18, 2015 shows the C-5 road in Taguig beside the fault line. The C-5 road is prone to liquefaction. The unfinished northern section of the C-5 Kalayaan elevated U-turn slot in March 2009, about two months before its completion. The proposal for the Metro Manila Arterial Road System was done in the late 1960s. The proposal states of building 10 Radial Roads and 6 Circumferential Roads to support the growing vehicular population of the Metropolitan Manila. The 5th Circumferential Road began construction in 1986. Under the power of Republic Act 8224, which was passed in November 6, 1996, the C-5 road was legally known as President Carlos P. Garcia Avenue, honoring the eighth president of the Republic of the Philippines, Carlos P. Garcia. On July 23, 2007, President Gloria Macapagal-Arroyo announced on her State of the Nation Address that C-5 Road will be extended to the north of Metro Manila, from North Luzon Expressway in Quezon City to Navotas and will be extended in the south from South Luzon Expressway in Taguig-Parañaque boundary to Coastal Road in Las Piñas in the southern part of Ninoy Aquino International Airport. As of June 2010, the NLEx-Mindanao Avenue Link or NLEx Segment 8.1 which is located in Valenzuela City and Congressional Avenue Extension from Tandang Sora to Luzon Avenue which is located in Quezon City has been opened to all motorists in the North Extension and also the SLEx-Sucat Link or Carlos Garcia Avenue Extension in the South Extension located in Parañaque was also opened. As of March 2015, the NLEX-Karuhatan Link (Segment 9) has been opened to all motorists. The opening of the Segment 9 from NLEx to MacArthur Highway in Karuhatan, Valenzuela serves as a preparation for the Holy Week season. At present, the New Commonwealth Avenue Flyover connecting Katipunan and Luzon Avenue is opened to all motorists. Before the opening of the flyover, the Congressional Avenue Extension from Visayas to Luzon Avenue opened in 2010 to decongest heavy traffic in Visayas-Tandang Sora Avenue Intersection. NLEX Corporation (formerly Manila North Tollways Corporation) and CAVITEX Infrastructure Inc., submitted a proposal for C-5 Expressway, a 19 kilometres (12 mi) fully elevated expressway that will further decongest the existing C-5 and provide a fully controlled-access route between CAVITEX-C5 South Link and NLEX Segment 8.2. . The proposed expressway will utilize portions of the existing C-5 right of way between SLEX and Pasig Boulevard, and run above Marikina River from Pasig Boulevard to Luzon Avenue. The Senate of the Philippines investigated the South Extension where it passes many of Sen. Manny Villar's properties such as Camella. The original C5 South Extension was called MCTEP, and was already approved by the Senate. MCTEP was a road that would be made as a toll expressway and resurrected as CAVITEX-C5 Link. These schools are located in Quezon City. C-5 Road at the intersection with Diego Silang Street in Taguig. 8.7779 East Service Road Southern end. E2 / AH26 (SLEX) – Alabang Half-Y interchange. C-5 Exit of SLEX. South end. Diego Silang Street At-grade intersection. No southbound access. Future Southeast Metro Manila Expressway (SEMME) exit. N190 (Kalayaan Avenue) C-5-Kalayaan Interchange. Former traffic light intersection. Access to Kalayaan Avenue westbound from C-5 northbound via elevated U-turn slot. Access to Kalayaan Avenue eastbound from C-5 southbound via elevated U-turn slot. Pasig Boulevard Traffic light intersection. 8.7790 North end of Bagong Ilog Flyover. Kaginhawaan Bridge Northbound only. Access to Dr. Sixto Antonio Avenue via P. Conducto Street. South end of Ortigas Flyover. N60 (Ortigas Avenue) C-5-Ortigas Interchange. Traffic light intersection at grade. No left turns from northbound. Access to C-5 southbound either through flyover ramp or traffic light intersection. 7.837 North end of Ortigas Flyover. Greenmeadows Avenue Traffic light intersection. Calle Industria Traffic light intersection. Katipunan Avenue Traffic light intersection. West end of Bonny Serrano Avenue segment. South end of Katipunan Avenue segment. P. Tuazon Boulevard, Major S. Dizon Street No left turns. Right-in/right-out for northbound intersection. N59 (Aurora Boulevard/Marcos Highway) Left turn and right turn from southbound service road. Right turn only from northbound service road. Xavierville Avenue Accessible from Katipunan Flyover southbound service road only. 9.3864 Carlos P. Garcia Avenue Traffic light intersection. Route number change from N11 to N129. Magsaysay Avenue Gated access to University of the Philippines. No left turns to Katipunan Avenue northbound. 9.782 Tandang Sora Avenue Southbound access only. North end of Katipunan Avenue segment. N170 (Commonwealth Avenue) Ramps with U-turns. Luzon Avenue North end of Luzon Avenue segment. West end of Congressional Avenue segment. Road 20, Road 20 Extension Accessible via U-turn slot from opposite directions. N127 (Quirino Highway) Traffic light intersection. Mindanao Avenue North end of Mindanao Avenue section. Route number change from N128 to E5. N128 (Mindanao Avenue) East end of expressway. Link with the future NLEX Segment 8.2. Route number change from N128 to E5. E3 (CAVITEX) – Manila Right-in/right-out interchange. Entry to CAVITEx only. Western end. Amvel City, Ninoy Aquino Avenue. Partial cloverleaf interchange. Multinational Avenue Traffic light intersection. Serves Multinational Village. Moonwalk Access Road At-grade intersection, and right-in/right out interchange. West Service Road At-grade intersection. Future interchange upon completion of flyover for the ongoing CAVITEX- C-5 Link Expressway over South Luzon Expressway and Skyway. ^ Google (January 5, 2013). "Circumferential Road 5" (Map). Google Maps. Google. Retrieved January 5, 2013. ^ a b "The Circumferential Road 5". scribd.com. Retrieved January 5, 2013. ^ Flores, Asti (February 7, 2013). "MMDA, DPWH name C5 Road as alternate route for EDSA overhaul". GMA News. Retrieved March 30, 2013. ^ a b "Controversies regarding the C-5 Road". slideshare.net. Retrieved January 5, 2013. ^ Ranada, Pia (May 18, 2015). "High resolution West Valley Fault maps launched". Retrieved February 19, 2016. ^ See, Aie (March 25, 2011). "C-5 Road, 3 Taguig barangays prone to liquefaction". Philstar. Retrieved February 19, 2016. ^ a b "Overview of the Metro Manila Arterial Road System". Department of Public Works and Highways (Philippines). Retrieved January 5, 2013. ^ Chan Robles Virtual Law Library. "REPUBLIC ACT NO. 8224-THE ACT OF CHANGING THE NAME OF THE C-5 ROAD TO CARLOS P. GARCIA AVENUE, TO HONOR CARLOS P. GARCIA, THE 8TH PRESIDENT OF THE REPUBLIC OF THE PHILIPPINES". Retrieved January 5, 2013. ^ Official Gazette of the Republic of the Philippines. "State of the Nation Address, July 23, 2007". Retrieved March 30, 2013. ^ a b "C-5 South Link Project". Department of Public Works and Highways. Retrieved October 28, 2017. ^ Camus, Miguel R. (May 9, 2016). 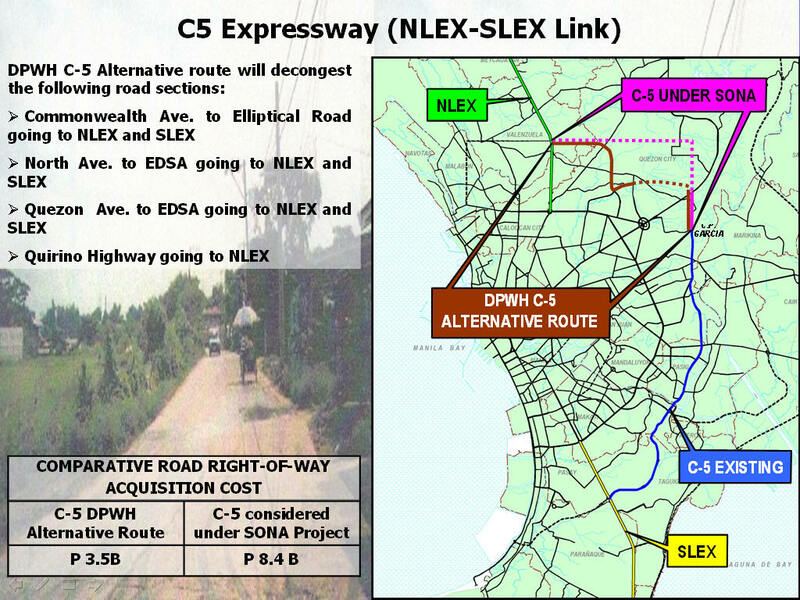 "Cavitex-C5 South Link Road project starts". Inquirer.net/Business. Philippine Daily Inquirer. Retrieved May 20, 2017. ^ "C-5 Expressway". DPWH PPP Portal. Department of Public Works and Highways. Retrieved July 30, 2018. ^ Legaspi, Amita (January 25, 2012). "'Villar intervened in C-5 project for his own benefit'". GMA News. Retrieved March 17, 2013. ^ Department of Public Works and Highways (2016). "Atlas 2016 Road Surface Type and Condition: Metro Manila 1st" (Map). 2016 Road Data. 1:70000. Retrieved May 19, 2017. ^ Department of Public Works and Highways (2016). "Atlas 2016 Road Surface Type and Condition: Metro Manila 2nd" (Map). 2016 Road Data. 1:45000. Retrieved May 19, 2017. ^ Department of Public Works and Highways (2016). "Atlas 2016 Road Surface Type and Condition: Quezon City 2nd" (Map). 2016 Road Data. 1:45000. Retrieved May 19, 2017. ^ "Metro Manila 1st". 2016 Road Data. Department of Public Works and Highways. Retrieved May 19, 2017. ^ "Metro Manila 2nd". 2016 Road Data. Department of Public Works and Highways. Retrieved May 19, 2017. ^ "Quezon City 2nd". 2016 Road Data. Department of Public Works and Highways. Retrieved May 19, 2017. The Circumferential Road 5–Kalayaan Avenue Interchange, also known as the C-5–Kalayaan Interchange, is a road interchange in Makati, Metro Manila, the Philippines. Originally a regular four-way intersection between Circumferential Road 5 (C-5) and Kalayaan Avenue, it was fitted in 2009 with the country's first elevated U-turn slots, built in an attempt to speed up traffic along the C-5 corridor. The Circumferential Road 5–Ortigas Avenue Interchange, also known as the C-5–Ortigas Interchange, is a pair of intersecting flyovers in Pasig, Metro Manila, the Philippines that serves as the junction between Circumferential Road 5 (C-5) and Ortigas Avenue. Originally a regular four-way intersection, the current interchange was inaugurated in 2003, and completed in 2004. Congressional Avenue (Filipino: Abenida Kongresyonal), is a 12.4 km (7.7 mi) highway located in Quezon City, Philippines, which spans from 6 lanes. It is one of the secondary roads in Metro Manila and part of it is designated as part of Circumferential Road 5 (C-5) of the Manila arterial road system and N129 of the Department of Public Works and Highways national highway system. Congressional Avenue starts from the intersection between EDSA and Roosevelt Avenue , and it passes through some of the Project Areas, Tandang Sora and ends at Luzon Avenue in the Old Balara area. The avenue, being located on Quezon City, is one of the rising food destinations in the city because many food establishments such as foodparks set-up shop particularly along the Extension Area. The Dr. Arcadio Santos Avenue or Dr. A. Santos Avenue, (formerly and still referred to as Parañaque–Sucat Road or Sucat Road), is the primary east-west thoroughfare in Parañaque, southern Metro Manila, Philippines. The avenue's western end is at Victor Medina Street in the boundary between La Huerta and San Dionisio, as the continuation of Ninoy Aquino Avenue. Physically, Ninoy Aquino Avenue connects northbound to NAIA Road in Pasay which, in turn, continues west to Roxas Boulevard back in Parañaque, and then to Macapagal Boulevard, where it finally ends. Its eastern end is at South Luzon Expressway, at the city's border with Sucat, Muntinlupa, where it becomes Meralco Road to service the rest of the route to Sucat railway station. The entire road is designated as National Route 63 (N63) of the Philippine highway network. Jose P. Rizal Avenue, more commonly known as J. P. Rizal Avenue, is a major local avenue in Makati, Metro Manila, Philippines. It is a contour collector road on the south bank of the Pasig River that runs east-west from Pateros Bridge in the Makati-Pateros border to Zobel Roxas Street in Tejeros Village. Starting at its eastern terminus at Pateros Bridge connecting Makati and Pateros, the road meanders through the residential communities of Comembo, West Rembo and Cembo. The road continues to Kalayaan Avenue. The Circumferential Road 5 then crosses above the avenue; one cannot go into C5 directly from J.P. Rizal Avenue, except when using Kalayaan Avenue as a conduit. It intersects with Eighth Avenue just past the University of Makati campus which connects it to Bonifacio Global City nearby. The avenue continues west through Guadalupe Nuevo where the Guadalupe ferry terminal and Guadalupe MRT Station are located. Crossing under the Guadalupe Bridge of Epifanio de los Santos Avenue (EDSA), the road runs through Guadalupe Viejo and Rockwell Center. West of Estrella Street, it enters the Makati Población area passing through the Casa Hacienda Park before coming to an intersection with Makati Avenue. The road gradually pulls away from the river at this point as it continues on a straight path to Chino Roces Avenue in Olympia. The section between Makati Avenue and Chino Roces carries one-way traffic westbound. Located on this section are the old Santa Ana Race Track, which is now being developed as a commercial and entertainment district called Circuit Makati, and the country's most expensive city hall. The avenue then curves northwest past Pasong Tirad before coming to its western terminus at Zobel Roxas Street near the city's border with Santa Ana district in the City of Manila. J. P. Rizal extends past C-5 road into East Rembo, Comembo and the municipality of Pateros as J. P. Rizal Avenue Extension. West of Zobel Roxas, it continues as Tejeron Street, ending at Pedro Gil Street. The avenue was named after the Philippines' national hero, Dr. José P. Rizal. The eastern section and extension between Guadalupe Nuevo and Pateros was formerly called Guadalupe-Pateros Road. Julia Vargas Avenue is the central east-west artery through Ortigas Center in Metro Manila, Philippines. It is a six-lane divided avenue that runs parallel to Ortigas Avenue to the north and Shaw Boulevard to the south. The avenue stretches 2.3 kilometers (1.4 mile) from C-5 Road in Ugong, Pasig in the east to Epifanio de los Santos Avenue (EDSA) in Wack-Wack Greenhills, Mandaluyong in the west. It was named for philanthropist Doña Julia Vargas y Camus vda. de Ortigas, wife of Ortigas & Company Limited Partnership founder Don Francisco Ortigas y Barcinas who owned the Hacienda de Mandaloyon estate on which Ortigas Center was built. Kalayaan Avenue is a major east–west route in Makati, Metro Manila, Philippines. For most of its length, it runs parallel to J.P. Rizal Avenue to the north from East Rembo near Fort Bonifacio to Singkamas Village by the border with Santa Ana, Manila. It is interrupted by Bel-Air Village between Amapola Street and Epifanio de los Santos Avenue (EDSA). The avenue is designated as a component of Radial Road 4 (R-4) of the Metro Manila Arterial Road System. The Kalayaan Flyover, also known as the EDSA–Kalayaan Flyover, is a four-lane flyover connecting Gil Puyat Avenue, Epifanio de los Santos Avenue (EDSA) and Kalayaan Avenue in Metro Manila, the Philippines. Located primarily in Makati with a short portion in Taguig, it facilitates access from the Makati Central Business District to the Bonifacio Global City and, ultimately, to Circumferential Road 5 (C-5). Preparation work for the flyover began in 1997, when the Bases Conversion and Development Authority (BCDA) announced the construction of two new primary access points to the Bonifacio Global City, with the flyover serving as the main western access point to the area. Designed by Katahira & Engineers Asia, actual construction of the flyover began in late 1997 with the construction of the segment between Gil Puyat Avenue and EDSA, contracted to the Uy-Pajara Construction Company. Work on the segment between Kalayaan Avenue and the Bonifacio Global City meanwhile began in April 1999, with the work being contracted to F.F. Cruz and Co., one of the Philippines' largest construction companies. Capable of holding up to 4,000 vehicles at one time, the flyover would reduce travel times between Makati and the Bonifacio Global City to five minutes by providing a direct connection between the two business districts instead of needing to route vehicles through EDSA.The 1.5-kilometer (0.93 mi) flyover was inaugurated by President Joseph Estrada and other government officials on January 25, 2000. Although promoted as a public project, it has been rumored that the ₱950 million spent for the flyover's construction did not come from public funds, but rather was underwritten by the First Pacific group through their local subsidiary, Metro Pacific.Despite being a flyover, the entire road is designated as National Route 191 (N191) of the Philippine highway network. Katipunan Avenue, also called as Katip, is a major avenue in Quezon City, Metro Manila, Philippines. It runs in a north-south direction from the University of the Philippines Diliman, intersecting with Tandang Sora Avenue at its northernmost point, down to the Manila Philippines Temple of The Church of Jesus Christ of Latter-day Saints, intersecting with White Plains Avenue at its southernmost point. The avenue is named after the Kataas-taasan, Kagalang-galangan, Katipunan ng mga Anak ng Bayan (KKK).The road is a component of National Route 11 (N11), National Route 129 (N129) of the Philippine highway network and Circumferential Road 5 (C-5) of Manila's arterial road network. The avenue has three lanes each way in most sections, widening to four in select areas, and narrowing to two lanes within Barangays White Plains and Saint Ignatius. An extension project, shelved by the government for the last six decades due to failed negotiations with private entities, has been revived by the Department of Public Works and Highways to address worsening traffic situations along Katipunan and Commonwealth Avenue, as well as Batasan–San Mateo Road. The project is expected to be completed in 10 months. This is a list of the expressways in the Philippines.Expressways in the Philippines are currently composed of 10 controlled-access highways that connect Metro Manila to provinces located in North and South Luzon. While not all expressways are interconnected, there is a plan to connect all of the expressways to form the Philippine expressway network. The Marikina–Infanta Highway, also known as the Marcos Highway or MARILAQUE Highway (MARILAQUE stands for Manila-Rizal-Laguna-Quezon), is a scenic mountain 110-kilometer highway that connects Metro Manila with Infanta, Quezon in the Philippines. The highway starts in Marikina near Katipunan Avenue, the Loyola Heights segment of Circumferential Road 5, in Quezon City. It traverses the Marikina Valley and passes through Antipolo, where it intersects the Sumulong Highway (at Masinag). After Masinag the road starts its ascent towards the Sierra Madre passing through Tanay, Rizal, Santa Maria, Laguna, finally to Infanta, Quezon. The Metro Manila Dream Plan, formally titled the Roadmap for Transport Infrastructure Development for Metro Manila and Its Surrounding Areas, refers to an integrated plan for improving the transport system in Metro Manila, Philippines, with the hope of turning it into a focal point for addressing Metro Manila's interlinked problems in the areas of transportation, land use, and environment.Consisting of a list of short term priority projects and medium to long term projects lasting up to 2030, the Dream Plan was created on the basis of recommendations from a study conducted by the Japan International Cooperation Agency (JICA) and was approved the National Economic and Development Authority (NEDA) Board in June 2014. The roadmap is thus sometimes also referred to as the "JICA Dream Plan", or the "NEDA Dream Plan". Mindanao Avenue (Filipino: Abenida Mindanao) is an eight-to-ten lane divided avenue connecting EDSA and NLEX and is a part of Circumferential Road 5 (C-5) in Metro Manila, Philippines. It is one of the three parallel roads that connects Tandang Sora and Congressional Avenues (Visayas Avenue and Luzon Avenue were the others); that is why it was named after the southernmost mainland of the Philippines, Mindanao. It used to be a 2 km highway connecting North Avenue and Congressional Avenue, but as a part of the C-5 projects, Mindanao Avenue was extended to EDSA in the south and to Quirino Highway to the north. The new roads opened in 2000.Another road also named Mindanao Avenue starts at Commonwealth Avenue and terminates at a dead end at School of Saint Anthony, Novaliches, Quezon City. That road is not in any way connected to the original Mindanao Avenue but was planned to be the one and the same road in the original plan for Quezon City. Mindanao Avenue replaced some segments of Tandang Sora Avenue belonging to C-5. (Tandang Sora has no access to NLEX) The Mindanao Avenue-NLEX road began construction afterwards. This segment became an expressway after its construction finished. In 2017, DPWH has resumed construction of the 3.2-kilometer Mindanao Avenue Extension Project, after being halted for years due to road right-of-way issues. A total of 1.4 kilometer portion of the road was earlier completed and opened since 2014. In June 2018, DPWH has opened additional 700-meter portion from P. Dela Cruz Street to the current end at MGM Road The road will be extended further until it meets General Luis Street to cater motorists coming from Valenzuela, Novaliches and North Caloocan. The station is the northern terminus of the line, which is totally underground. Its location is aimed to help commuters from Northern Metro Manila, particularly in the Novaliches and Fairview areas, to have an alternative means of transport going to the southern parts of the metropolis. Radial Road 3 (R-3) is a network of roads and bridges that altogether form the third arterial road of Manila in the Philippines. The road runs north-south linking the City of Manila to the southern Metro Manila cities of Makati, Pasay, Taguig, Parañaque and Muntinlupa, down to San Pedro, Biñan, Santa Rosa, Cabuyao and Calamba in the province of Laguna, all the way to the Southern Tagalog Arterial Road from Santo Tomas to Batangas City in the province of Batangas. The portion of R-3 from Epifanio de los Santos Avenue (EDSA) in Makati to Calamba also forms part of the Pan-Philippine Highway network (AH26). The Smart Connect Interchange, also known as the Mindanao Avenue Interchange and the North Luzon Expressway–Circumferential Road 5 Interchange, is a two-level cloverleaf interchange in Valenzuela, Metro Manila, the Philippines which serves as the junction between Circumferential Road 5 (C-5) and the North Luzon Expressway (NLEx). Built as part of the 2.7-kilometer (1.7 mi) NLEx–Mindanao Avenue Link segment extending the expressway to Mindanao Avenue, which has since been incorporated into the C-5 system, it is the Philippines' largest cloverleaf interchange in terms of land area. The Southeast Metro Manila Expressway is an under construction 34 kilometres (21 mi) tolled expressway running across eastern Metro Manila and part of Rizal. The expressway will help decongest the existing roadways across Metro Manila, such as EDSA and Circumferential Road 5. SEMME is also known as Skyway Stage 4. The expressway is part of the larger C-6 Expressway project. The expressway will begin at the Skyway in FTI, Taguig, and will end at the Batasang Pambansa Complex in Quezon City. It will also connect to the North Luzon Expressway (NLEx) in Balagtas, Bulacan.Groundbreaking ceremony of the project was held on January 8, 2018. Tandang Sora Avenue is a major east-west thoroughfare bisecting Quezon City in Metro Manila, the Philippines. It is a two-to-six lane highway and municipal road that runs for 9.6 kilometres (6.0 mi) from its eastern terminus at Magsaysay Avenue in Matandang Balara and U.P. Campus in Diliman to its western terminus at Quirino Highway in Baesa and Talipapa in Novaliches, crossing the Quezon City villages of Culiat, New Era, Pasong Tamo, Tandang Sora and Sangandaan in Districts III, IV and VI. The avenue's segment in Matandang Balara and U.P. Campus east of Commonwealth Avenue is a national secondary road with route designation N129. This segment also forms part of Manila's Circumferential Road 5 (C-5) network. Its western segment in Tandang Sora and Culiat west of Commonwealth Avenue is a narrow municipal road classified as a national tertiary road. Tandang Sora Avenue was named after its location in the barangay of Tandang Sora. The barrio, in turn, was renamed from Talipapa in 1952 in honor of Filipina patriot Melchora Aquino.A flyover linking Tandang Sora Avenue with Luzon Avenue over Commonwealth Avenue in Culiat was built in 2009 as part of the C-5 Road network project. In February 2019, the Department of Public Works and Highways announced the demolition of a flyover of Commonwealth Avenue at the Tandang Sora junction in New Era to make way for the construction of the Tandang Sora station of the Manila Metro Rail Transit System Line 7 (MRT-7). A Metro Manila Subway station is also planned at the avenue's junction with Mindanao Avenue in Tandang Sora.